If you’ve seen the trailers, you know the premise: it’s 2044. Time travel doesn’t exist yet, but it will: in the 2070s, mobsters use it to evade the advanced forensics of the time by sending targets back in time to be murdered and cremated. The hit men are well-paid and there’s only one caveat: it’s likely that at some point the mob will decide they’re a risk to have around and send them back in time to be killed by themselves. This is called “closing the loop,” and accordingly the hit men are called “loopers.” Our protagonist, Joe (Joseph Gordon-Levitt), is a looper, but he runs into trouble when he has to close his loop: his future self (Bruce Willis) appears without the usual gag and cuffs, knocks him out, and escapes. There’s a lot more to the story, of course, but I won’t spoil it here. Figuring it out is half the fun in this smart, complicated film. It’s refreshing to watch a movie that assumes its audience is both intelligent and paying close attention. 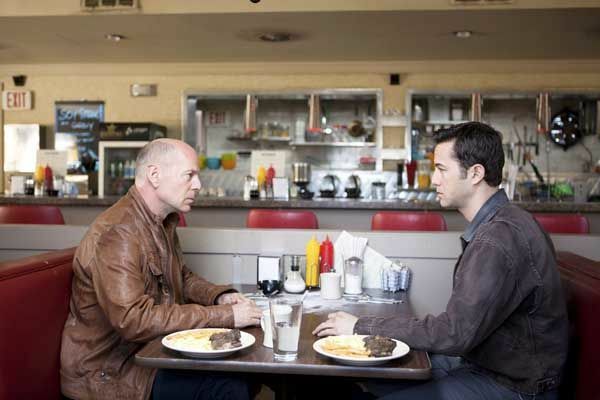 “Looper” does a lot of things right, starting with not going into exposition any more than absolutely necessary. There are a lot of little details to indicate how the future is different (odd bank notes, cars from our time with tubes and wires obviously being used to make them run on something other than gas, etc.) but no speeches about what’s happened. Time travel is dismissed as “messy” and something that “screws with your head” and never fully explained. The film is internally consistent about how it works, but nobody tries to tell us the details. The special effects are sparse and mostly very good — a flashy floating motorcycle, distant views of a futuristic city with looming skyscrapers, and so on. The only bit that fell flat for me on this front was the use of prosthetics to make Gordon-Levitt look more like Willis. The makeup is a little too obvious, and for folks like me used to seeing the younger man’s regular face, a little disconcerting. It’s not necessary, either. Gordon-Levitt clearly did a lot of work learning Willis’ intonations, facial expressions, and gestures, so his performance is rock-solid. The prosthetics just call attention to the difference in the men’s faces.